Joseph Rudyard Kipling (30 December 1865 – 18 January 1936) was an English short-story writer, poet, and novelist. He is chiefly remembered for his tales and poems of British soldiers in India and his tales for children. He was born in Bombay, in the Bombay Presidency of British India, and was taken by his family to England when he was five years old. Kipling is best known for his works of fiction, including The Jungle Book (a collection of stories which includes “Rikki-Tikki-Tavi”), Just So Stories (1902), Kim (1901) (a tale of adventure), many short stories, including “The Man Who Would Be King” (1888); and his poems, including “Mandalay” (1890), “Gunga Din” (1890), “The Gods of the Copybook Headings” (1919), “The White Man’s Burden” (1899), and “If—” (1910). He is regarded as a major “innovator in the art of the short story”; his children’s books are enduring classics of children’s literature; and his best works are said to exhibit “a versatile and luminous narrative gift”. Kipling was one of the most popular writers in England, in both prose and verse, in the late 19th and early 20th centuries.Henry James said: “Kipling strikes me personally as the most complete man of genius (as distinct from fine intelligence) that I have ever known.” In 1907, he was awarded the Nobel Prize in Literature, making him the first English-language writer to receive the prize, and to date he remains its youngest recipient. Among other honours, he was sounded out for the British Poet Laureateship and on several occasions for a knighthood, all of which he declined. A recent Guardian article tells the fate of Kipling’s son and mentions the poem Kipling wrote about him. Born in Malaysia, moved to Australia, Vanessa first saw England at 3 years old. As a teen, Vanessa learned her love of canoeing in the alligator infested bayous of the Texas Gulf Coast. Now back in her favourite place in the world, Yorkshire, she watches the River Ouse rise every winter and wonders if she needs to revive an old skill: so far she and her son have been lucky. When not writing, she juggles fighting for a decent education for her autistic son with wrestling the Creatures of the Night, though that’s not a nice thing to call her cat. Vanessa has concentrated on her writing since becoming widowed in 2001, as being a single mother of a disabled child made it impossible to work the required shifts in NHS Biochemistry laboratories. 2006 saw her beginning her writing career proper with the publication in the US of Witch-Finder, a collection of short paranormal adventures. Since then a further collection of paranormal short stories, Hard Lessons and a related novel, A Date with Darkness, have also come out. The dystopian fantasy novel Pill Wars is an exciting new direction. It is due for release in summer 2014. Both authors were born in a British Empire country – Kipling in India, Vanessa in Malaysia. They both came to England at an early age and also lived in America. Kipling’s poem Cold Iron is part of the inspiration for Vanessa’s short stories. 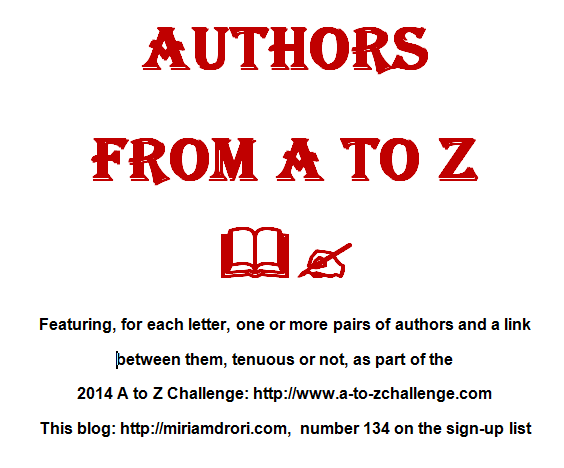 Here’s another blogger taking part in the A-Z Challenge, apart from those I listed here. Carrie-Anne Brownian of Welcome to My Magick Theatre is posting about less-well-known places in the world and including interesting information and beautiful pictures. Kipling is a rather inspirational author, no matter which way one wishes to interpret his writings. Interesting pair – one known for his literary nonsense, one having earned enemies. Means, I guess, that they were doing something right. 🙂 Thanks for the interesting post, Miriam.